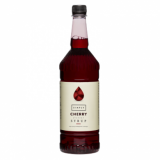 Monin Natural Cherry (Cerise in French) syrup in stylish 70cl glass bottle. Throughout the centuries, cherry trees have been enjoyed for their succulent fruit as well as their beauty. Cherry fruits have enticed the palate for centuries and many varietals now exist. Since ancient times, cherries have enjoyed a special place on tables from the Middle East to Europe. The cherry fruit is popular raw, in preserves, and in pies. Cherry cider, liqueurs and syrups are also made. MONIN Cherry is available year-round to impart deep summer cherry flavour to all your beverages. Applications: Cocktails, sodas, smoothies, fruit punches, teas, cocoas. 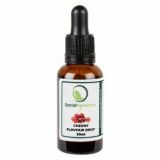 Sugar, water, concentrated cherry juice, concentrated lemon juice, natural flavouring, colouring agent: E163. Total fruit juice: 29% minimum, including 15% cherry juice. Contains bitter almond extract.